You have probably heard that in VMware vSphere 4, ESX now supports up to 8 virtual CPUs per virtual machine. A related change that hasn’t gotten much attention is the fact that ESX no longer requires the number of vCPUs in a VM to be a power of two — 2, 4, 8. Will you deploy VMs with 3, 5, 6, or 7 vCPUs? How many nic’s can i use with vsphere? is the maximum 4, like in the old version? 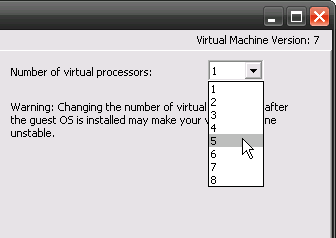 Milo, vSphere allows 10 NICs in a VM. Check out this article that discusses the vSphere configuration maximums document. This is quite useful when you want a lot of cores on your VM, but don’t want to oversubscribe. It is not recommended to run a VM with 4 cores on a host with 4 cores, since 1 core is usually needed for running VMkernel and other processes. So you can create a VM with 3 cores and get the best performance. Likewise, you can create a 7 core VM on a host with 8 cores. Although you can certainly do 4-on-4 or 8-on-8 it is generally not recommended due to co-scheduling concerns.